Some quick notes and resources for our third day's topic, which was The Digestive System and The Teeth. Remember that all of my notes for this main lesson block can be found in much more detail on my website. The Drops on a Penny experiment for surface tension was really interesting! The girls tried it, and several variations of it, over and over. 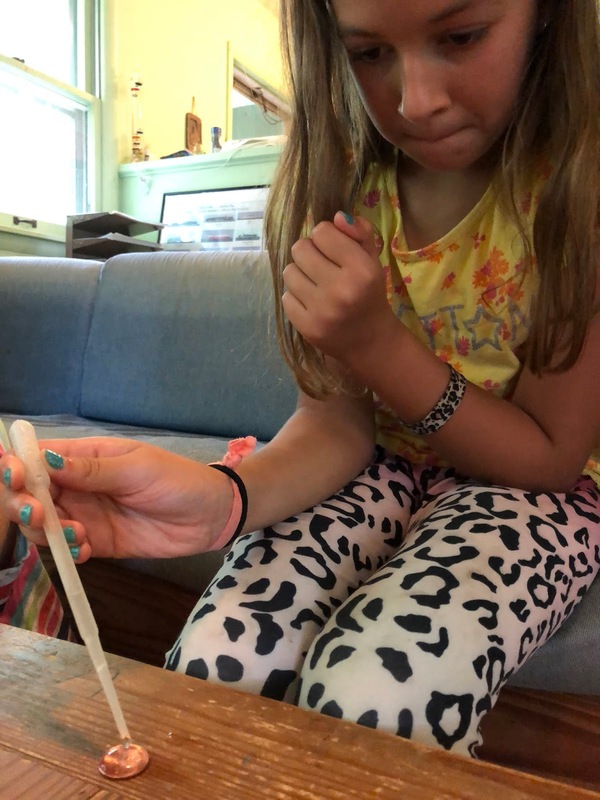 They were able to fit 21 drops of water on a penny each time for their first three times, but by the fourth time they had fine-tuned their pipette technique and fit 37 drops on (pictured above)! Then I showed them my fruit fly trap and explained that detergent breaks surface tension (which is why our lungs secrete a detergent substance, reducing the surface tension of the fluid lining and allowing air in). They heaped water on their penny and then put a drop of dish detergent on it. Bam! Surface tension broke and water cascaded everywhere. They also tried putting detergent directly on the penny before adding the water, to see if this would affect how many drops would fit on it. This post contains affiliate links to materials I truly use for homeschooling. Qualifying purchases provide me with revenue. Thank you for your support! Picnic & Play: Whose Garden Is It?